If the upload of the Active Sequence fails it is good to keep an eye on Adobe's Media Encoder (AME). Sometimes AME gives you a good hint what the issue could be. But in general if it fails to render the Sequence, the upload will logically fail and the Panel shows a red circle. In Media Encoder, when you see a yellow warning sign next to "Failed" you can click it and a text editor should launch with a long text document. Typically the last line of this long log will tell what the issue is. Feel free to send the entire log to Support to troubleshoot the issue further. If you repeatedly upload the Sequence without changing the scratch disk path and the Sequence's name, AME is likely to fail as it does not overwrite existing files. The workaround is to enable Preferences ... > General > "Increment output file name if file with same name exists". AME will automatically append an incrementing number to your render output file names. As we are starting to discover and figure out solutions for failed uploads, it is good to first check if you're able to queue/ render the sequence directly in AME without the Frame.io Panel. 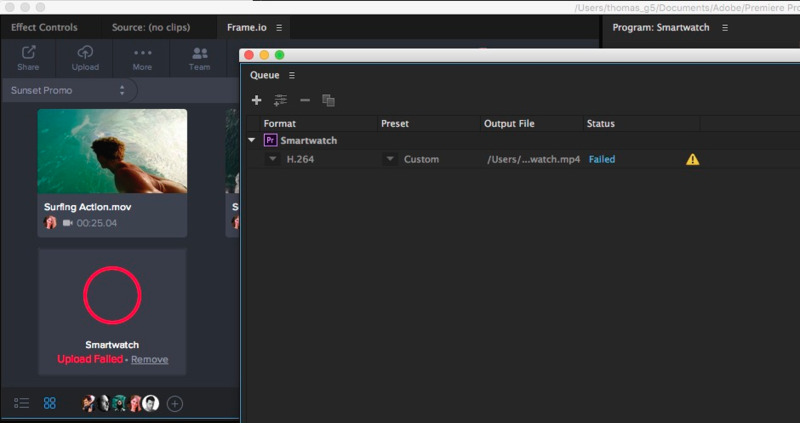 We had several occasions where queueing the sequence did not work, which could only be solved by re-installing Premiere Pro. Another reason for users reporting failed uploads was AME not being able to write files to a certain location. To test if it is a permission issue simply try to set the render output location to Custom Folder... and select your Desktop. If it renders out fine and the upload starts, then you know that the permissions have to be adjusted on your former output location. An error was encountered while writing the output file. The output destination could not be found. Check that the output directory still exists. If the output directory is on a network or external device, check that the connection is active. be sure to set the render location again. 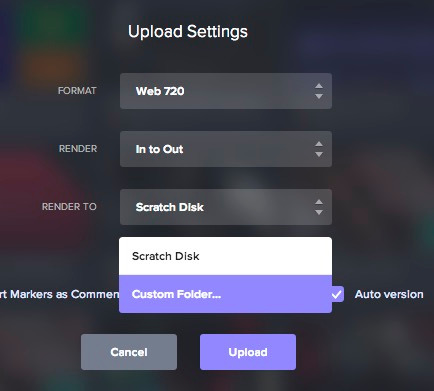 If you're trying to render to a shared network drive, Media Encoder may not allow this and it would be best to set the location to a local drive on your computer to test.